The Australian Flag was first flown in 1901. 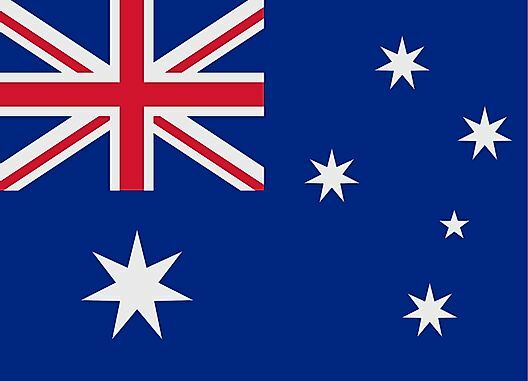 The flag consists of three elements: the Union Jack, the Commonwealth Star and the Southern Cross. In the upper left corner the Union Jack represents Australia's association with Great Britain. Directly below the Union Jack is the white Commonwealth, or Federation star. Six of the stars represent the unity of the states. The seventh point, added to stars in 1909, denotes territories of the Commonwealth of Australia. The Southern Cross with its five stars, is on the right side of the flag. The stars are a reminder of Australia's geographical location, as this constellation can only be seen from the southern hemisphere. The Australia Coat of Arms consists of a shield portraying the badges of the six Australian states, enclosed by an ermine border. The three states on the top half, from left to right are New South Wales, Victoria and Queensland. The bottom half, from left to right are South Australia, Western Australia and Tasmania. The shield symbolizes the federation of the states, which took place in 1901. Supporting the Coat of Arms are the red kangaroo and the emu, native Australian animals. Neither animal can walk backwards, thus representing progress and an unwillingness to back down. The background contains a wreath of Golden Wattle, the official national flora emblem. At the bottom of the Coat of Arms is a scroll containing the name Australia. Above the shield is the crest, a seven-pointed gold star on a blue and gold wreath. Six of the points are representative of the states of the Commonwealth, the seventh point represents the territories of Australia.